María Suceso Portales Casamar was born at Zahinos, Badajoz on the 4th March 1904 (though other sources give 8th April as her birth date) into an anarchist family. Her siblings Acracio, Juan and Luis were also to be active within the anarchist movement. She worked as a dressmaker and in 1934 joined the CNT in Madrid. 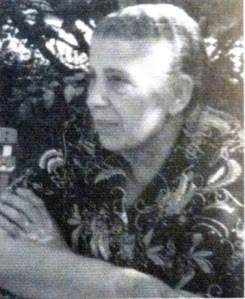 In 1936 she took part in collectivisation and was one of the founders of Mujeres Libres, the libertarian women’s organisation, contributing to its paper. When the Spanish Revolution and Civil War broke out she moved to Guadalajara where she propagandised among the peasants and acted as an advisor in their collectivisations. She was extremely active in an intense literacy drive amongst the peasants. She helped found Mujeres Libres groups in Guadalajara, Horche, Yélamos de Arriba, Yélamos de Abajo, Tendilla, Mazuecos, Mondéjar, etc. She took part in the national congress of Anarchist Confederal Women on 20th August 1937 and in the founding of the Farm School San Gervasio. In October of the same year she participated in the National Congress of Mujeres Libres in Barcelona as the Guadalajara delegate. She regarded the events of the Spanish Revolution as a double break, on one hand with class society and on the other with the supremacy of “masculine civilisation”. She enunciated these ideas in the pages of Mujeres Libres, where she addressed herself to the condition of women in a country dominated by entrenched ideas of machismo. At the end of the War she fled to the port of Alicante where with 183 others she managed to board the Galatea bound for Britain. In London she was sheltered at the house of Peggy Spenser for some time. She continued to take part in the activities of the exiled Spanish anarchist movement and was in contact with the underground resistance back home (her brother Juan was in prison there). She contributed to various Spanish libertarian publications and took part in all the demonstrations against the Francoist regime, including those to protest the visits of Francoist ministers to London, Fernando María Castiella in July 1960 and Manuel Fraga Iribarne in November 1963. She was one of the delegates of the London group of exiles at the Congress of the CNT in Limoges in France in 1961. In 1962 she was in contact with various Spanish libertarian exiles in France and was involved in refounding the Mujeres Libres magazine. She launched a special edition of this entitled Mujeres Libres in Exile. She also contributed to other libertarian publications like Espoir in Toulouse and Frente Libertario in Paris. In 1972 she moved to Montady , near Béziers, in France, where Sara Berenguer, another stalwart of Mujeres Libres, was established. Here she was involved in editing the Mujeres Libres magazine up until 1976. After the death of Franco she returned to Spain and began to re-organise the CNT in Guadalajara along with Saturnino Mauricio and others. She took part an and spoke at the massive rally of the CNT in San Sebastian de Los Reyes near Madrid in March 1977. In the 1980s she moved to Novelda in Alicante province and took part in the reconstruction of the Mujeres Libres organisation, though she had certain reservations about the latter orientation of the organisation. The last public event she attended was a 60th Anniversary celebration of the founding of Mujeres Libres. Finally she moved to Seville, where he died, at age of 94 on 23rd January 1999.